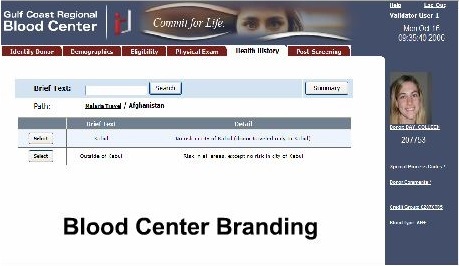 Healthcare-ID has been offering a Donor Screening Software System since 1995. We provide donor screening software, hardware, and services to assist blood collection centers by providing complete, secure data collection during the entire donation process. This results in increased donor satisfaction, along with medical error prevention and cost reduction by focusing on positive identification combined with data verification and capture at the point of care. The common basis of these systems is the use of computer technology and bar coding to achieve productivity improvement, paperwork reduction, and improved quality of patient and donor care while increasing the safety of the product or service. All event data is captured and verified at the time the service is performed. This includes date, time, and caregiver for all steps. We offer full support for both fixed and mobile collection sites, as well as an interface for Donor Data to and from the collection center’s BECS.